In sixty years the Ballina Players in northern New South Wales has grown from humble beginnings to a successful company with its own custom-built 142-seat theatre. David Spicer dropped in on a rehearsal. It was a hive of activity. The first run through of act one for Oliver! – a production which the company was proud to sell out for 17 performances. Owning their own venue meant they could rehearse on the set. Parents were watching on from the audience and volunteers were busy working on costumes. When I visited, the Director was having trouble getting the children’s chorus to march in time to the music (but I am told it was right on the night). Food glorious foooooooood…. Then onto the stage came the charismatic Mr Bumble, with sideburns that made him look like he had stepped straight out of Victorian England. He showed plenty of shtick in the duo ‘I could scream, scream, scream’. I was intrigued to discover that Mr Bumble (Rod Ramsay) was a ‘local’ beef farmer. Even though he lives on 20,000 hectare cattle breeding farm at Drake, one hour and forty minutes away, he has rarely missed a production since 2002. “I am a tenor. I do not know anyone else doing shows who is an active farmer. I am one of a kind,” he said. So keen is Rod that he often stays overnight in town during rehearsals and performances to get away from ‘old fart’ farmers and mix with younger people. “Every other place I go out socially, people want to talk about their dog, their horse, the weather or whinge about the government,” he said. “Theatre folk have a totally different language. Rod tries to ‘show off’ in two musicals a year, in the chorus or in character roles. The company values his on-stage personality and his farming skills. Occasionally Rod has missed a rehearsal when farming demands such as cattle mustering have overwhelmed him, but he’s proud that he’s never missed a performance. Sometimes he is forced to rehearse in the paddock. Characters like Rod are the lifeblood of small and regional community theatre companies. In 1955 Joan Williams, newly arrived in Ballina and in need of a diversion, called a meeting of people interested in drama. Ballina Players was born and sixty years later Joan still proudly follows the fortunes of the group she has watched grow from strength to strength. Initially the Players used small classrooms and local halls. They raised funds by travelling with shows to surrounding towns and villages. Limited sets and equipment were loaded onto a borrowed truck on the understanding that it would be returned and unloaded in time for an early morning run. The local picture theatre occasionally made room to accommodate the company. In 1984 construction under a Commonwealth Employment Grant gave the Players its home. 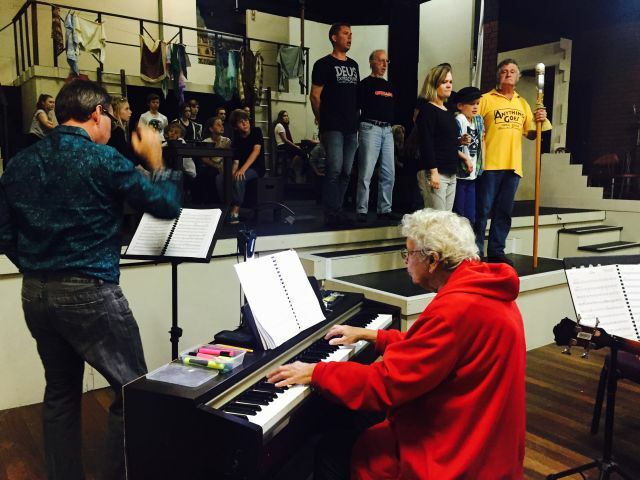 A vibrant amateur theatre group is seen as a great asset in a country town and its surrounds. The Players draw on cast, crew and audiences from a wide area of the Northern Rivers. President Warwick Binney says he is proud to lead the company in its sixtieth year. 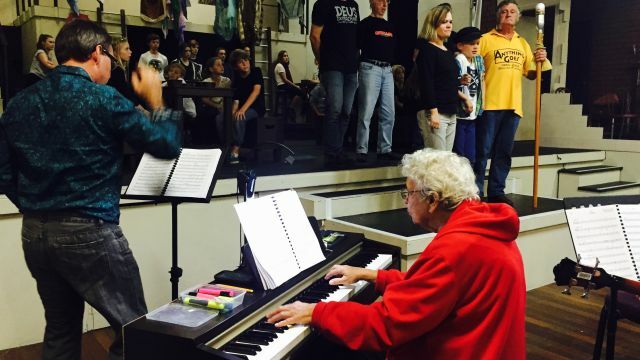 Each year two musicals, two plays and a youth musical are staged. The latter is widely respected for providing the region’s youth with an important training ground in theatre skills. A number of graduates have gone on to take up tertiary study in theatre arts. The sixtieth season opened with a very successful Alice in Wonderland JR, followed by the radio play It’s a Wonderful Life, then Oliver!, Moonlight and Magnolias (a comedy about the making of the movie Gone With the Wind), with Big River to end the year. Legally Blonde Jr will be in rehearsal for performance in January. There is much more to Ballina Players than just producing shows. Newcomers to the group are struck by the friendliness and family atmosphere. Clem Halpin, director of the 2015 production of Oliver! and new to the Players, said that the warmth of the Ballina welcome and the level of cooperation he received made it a very rewarding experience. Each year Ballina Players participates in the Gold Coast Theatre Awards and has been nominated in a number of categories. In 2012 the Players were gratified to receive the prestigious Platinum Palm Award for “all matters relating to front of house, hospitality, box office and the interface between community and the theatre”. With such spirit the Players will have no trouble making another sixty years.